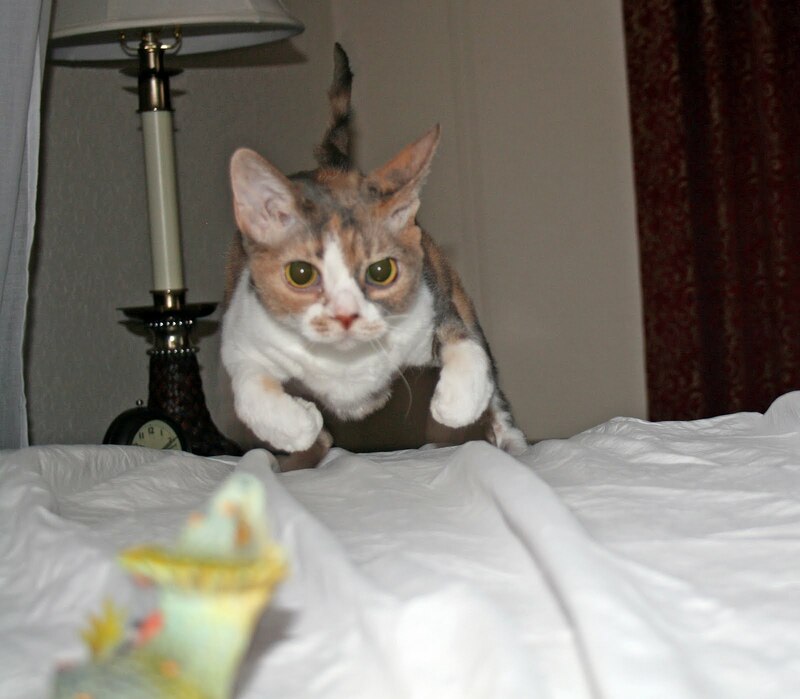 Daisy the Curly Cat: Dragonslayer! Look! A giant dragon. IN THE BED! I will spy on him for a second. There is no question. He is Bad. Um, I did not hurt you too badly, did I? I wouldn't worry, Daisy. I bet that even if you killed that dragon, it wouldn't hurt him too badly. Miss Daisy, we did not think we could love you more, but seeing how brave you are we DO! Miss D was he tasty? You are the cutest little attack kitty ever! Wow Daisy, you are SO brave!! Yikes!! Daisy you are my hero!! Daisy your Mom or Dad has such excellent photography skillz to get that third photo perfectly showing you attack! You're brave, Daisy, but also kind. That is a wonderful combination! That is a scary dragon. You are very brave Daisy. I love that jumping shot of you, Daisy. You have such an intense, determined look on your face! Great leap Daisy. That was well done. It looks like you didn't hurt the dragon. That is an interesting dragon. Hope all of you have a really fine day. You are a ferocious hunter, Daisy!!! You are very fierce Daisy - we bet that dragon didn't know what had got him you were so quick on the pounce. Was Harley hiding?? haha!! Oh, we love those shots! Especially your expression in pic #2 and your mid-leap in #3! Your pouncing pic is PAWesome!!! Oh, my goodness! Daisy you are so fierce and brave! Save a little for a snack later and don't forget to share with your brother. Wow! That is a really cool looking dragon, and you are a fancy dragonslayer, Daisy! Are dragons able to drop their tails like lizards too...? Maybe you could keep his tail! GREAT action shot, Mommeh! Aren't all toys much more exciting on the bed??? Geesh, all those wrinkly covers and jumpy surface....how fun! Wow, such focus! Daisy you are a might hunter! You can't go easy on dragons or the next thing you know they've turned your house into a burnt-out lair and are sleeping on a pile of loot in the living room. Wow Daisy, that is a colorful dragon! So, did you make dragon fillets? We agree. He's absolutely BAD!!! And you are an excellent huntress, Miss Daisy. I bet your people feel lots safer with you around Daisy! Daisy, your mommeh is very brave! 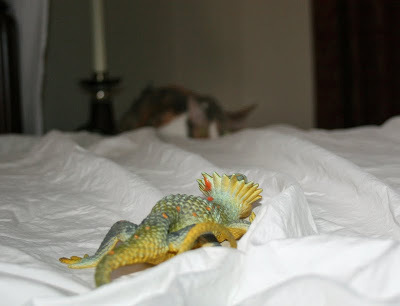 I would not have been calm enough to take photos if there was a dragon in my bed. Daisy Dragonslayer! You are good! It does look like an evil dragon. You killt it real good! But then that was very nice of you to check on it afterwards. We agree, Daisy, one Look is all it takes to tell a Bad Dragon from a Good one. And only one spectacular Leap to slay him! pee ess: was he sitting on a pile of gold? We've heard Dragons do that, sometimes. That is a pretty awesome action shot of you pouncing the dragon! Good job! What a mighty hunter you are Daisy! Your eyes are very excited to be pouncing on that beastly dragon! You are sooooo brave Daisy! You are very brave Daisy! It was nice of you to make sure you didn't actually hurt the dragon! Wow - totally awesome action shot Daisy. Well done to your cameraman!! You could be in a fantasy novel as the fighting princess!! Yoo are da total package Daisy, beyootiful, brave, giving, loving and yoor fashon sense is da best! Pounce that thing Daisy, get him!! Whew! Ohhhh, your house is starting to look like the Katnip Lounge! Wow, what a great picture of you attacking that monster. At least you have some remorse, Daisy -- not like the cats of the Katnip Lounge who bite the tails off their dragons! It looks like you're kissing him in that last picture. 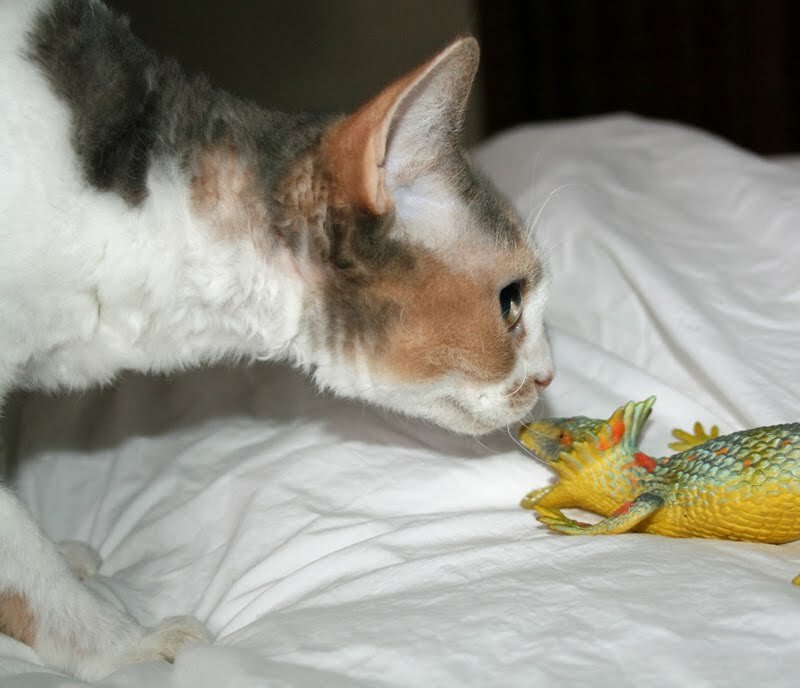 Even dragons can be furiends, as long as you really don't slay them. Fantastic action shots of your stalk and leap, Daisy! You are quite the thoughtful dragon slayer too. Nice touch! Daisy, what is that....that...THING? Is it real? You're so brave. I'm secretly a coward (we,, maybe not so secretly). Daisy, I think that is the cutest attack cat picture I have ever seen!!! Wowie!! 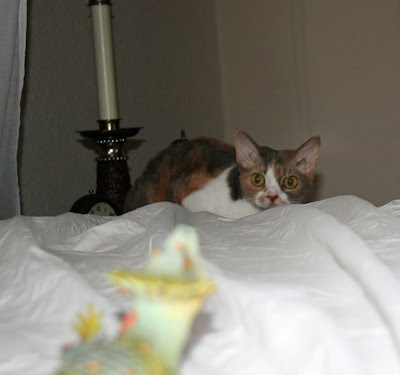 Daisy, that was a quick move to pounce on that dragon!! Good job!! You are one very brave cat, Daisy! Wow, that third photo in mid-leap is exceptional! Perfect timing with the camera (and the leap). And we would like to wish Harley a belated Happy Gotcha Day! did yoo carry him arownd?? ?